When illiberal regimes lose their legitimacy, when they run out of excuses, when they feel their power slipping away, they almost always resort to scaremongering and scapegoating. Suddenly, imaginary threats are everywhere. Everyone who does not toe the line becomes an enemy, an agent of dark unseen forces, part of some sinister conspiracy. All criticism, all dissent becomes seditious, unpatriotic, anti-national, a threat to national unity. The ensuing tensions then provide the context and justification for further repression and for increased curtailment of fundamental liberties. What’s left of democratic space slowly vanishes. Is the same thing now happening in Malaysia? Trapped in an increasingly untenable position over the massive 1MDB corruption scandal, Prime Minister Najib Tun Razak and a close coterie of advisers appear to have adopted a strategy of trying to divert attention away from their own failures by playing up racial and religious issues, stoking fear and division and releasing their own version of the “red guards” to intimidate and terrorize. With the connivance of the official media, old racist canards about the Chinese – that they are selfish, self-centred, ungrateful, money-grabbing, disloyal, unpatriotic, racist, disrespectful of Malays and Islam, that they control the economy, that they are blocking the progress of the Malays, etc. – are being highlighted once again. What the red shirts, and by extension UMNO, appear to be selling is the preposterous notion that despite decades of endemic corruption, abuse of power, mismanagement of the economy, fiscal irresponsibility and the degrading of our national institutions under UMNO rule, it’s the Chinese who are really to blame for all the nation’s problems. And the DAP, despite its multiracial character [it is in fact far more multiracial than any BN party] is somehow the chief villain, spearheading a sinister Chinese plot to overthrow the government, seize power and marginalize the Malay community. Anyone who knows anything about Malaysia and the overwhelming control that UMNO exercises over almost every single national institution, over every single lever of state power, will know how utterly asinine such a view is. It is so absurd that surely not a single UMNO leader really believes it but it is useful to confuse, distract and shift the blame. The danger, of course, is that the red shirt mob will soon start believing the web of lies and deception they weave and take it to even more inane heights. One senior UMNO politician who was prominent during the red shirt rally, for example, went so far as to defend his racism by claiming that it is an Islamic obligation. Has it come to this now when racism is worn as a badge of religious fealty instead of the disgrace that it is? Is nothing sacred to them anymore that they would turn a religion of peace and tolerance into an instrument of discrimination and hate? And all because the current leadership is feeling insecure and vulnerable, and worried about the real challenge to its power – not the DAP or the Chinese – but dissent within its own ranks and within the wider Malay/Muslim community. Najib’s most dangerous critics, for example, come from within his own party. 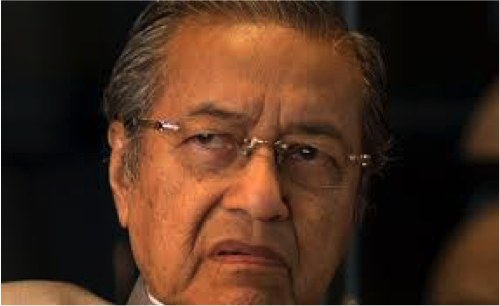 Is any one more of a thorn in Najib’s side than former prime minister and UMNO president, Dr. Mahathir Mohammad? [Right] Is any one more wary of Najib than his own deputy Muhyiddin Yassin? Has anyone been more aggressive in uncovering the truth about the 1MDB scandal than former UMNO leader Khairuddin Hassan? But Mahathir is still revered within the Malay community and Muhyiddin still commands strong support in the south, so the party must proceed cautiously against them. 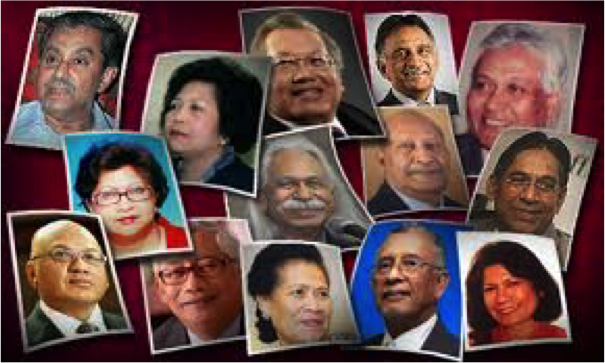 Several UMNO luminaries like former ministers Tenku Razaleigh Hamzah, Rafidah Aziz, Zaid Ibrahim and Saiffudin Abdullah have all spoken out strongly against the racist turn that UMNO has taken via the Red Shirts. Others like former prime minister Abdullah Ahmad Badawi, and Idris Haron, the chief minister of Malacca, also appear to be increasingly uncomfortable with the party’s racism but again, it’s politically risky to hit out at them. 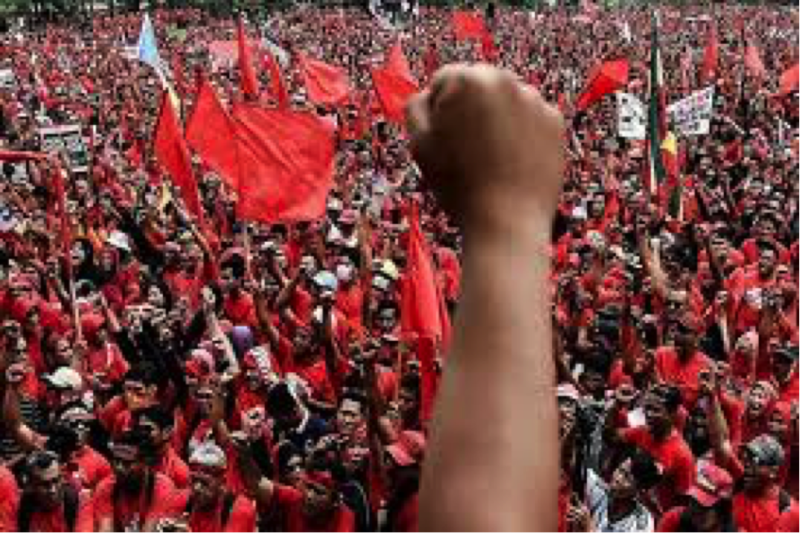 UMNO is also losing ground to other Malay/Malay-led political parties like PKR, PAS and Amanah while more and more Malay NGOs, academics, professionals and young student leaders are breaking ranks with the UMNO narrative and speaking out. We’ve even seen senior government officers openly critical of UMNO’s machinations. The royals too, impatient and unhappy with the direction the country is taking, are growing more vocal in their criticism. 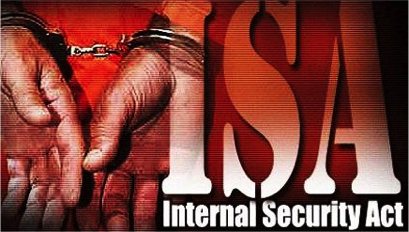 One has only to read the alternative media to appreciate how widespread the dissent is. Clearly, there’s a dawning realization that after almost six decades of unbroken UMNO rule, despite amassing untrammelled political power, despite billions of dollars in expenditure, despite lofty promises and great speeches, Malaysia is no where near where it ought to be in terms of living standards, quality of life and national progress. While the cronies grow richer with each passing year, working-class Malaysians sink deeper and deeper into debt and struggle to make ends meet. They pay more for accommodation, for transportation, for utilities, for transport, for food and clothing and almost everything else because the economy is structured to allow cronies to exploit the citizenry with impunity. 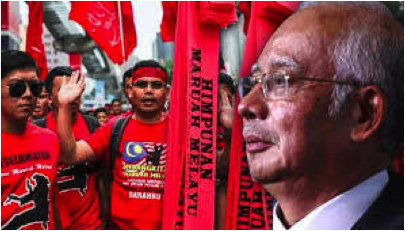 Clearly, UMNO has failed – it has failed the Malays, and it has failed everyone else. But all this, of course, detracts from UMNO’s Malay versus Chinese strategy, and are downplayed or hushed up. Instead, UMNO is trying to turn its Malay ‘problem’ into a Chinese one. And so it is that the DAP and Malaysian Chinese must bear the brunt of UMNO’s failures. But make no mistake, though the ostensible target is the DAP and its supporters, the real victim will be democracy itself. With state-sponsored tensions now rising, the stage is set for a new round of repression. UMNO leaders are already calling for the re-introduction of detention without trial, censorship of the internet, further restrictions on the media and the expanded use of sedition and other laws to curtail dissent. Ominously, Najib himself is now conflating calls for his resignation, something that is par for the course in other parliamentary democracies, with attempting to illegally overthrow the government, and warning of stern consequences. At this rate, as national laureate A. Samad Said has warned, what is left of Malaysia’s democracy will be gone before the next election. The only hope for Malaysia’s future now lies in the hands of moderate Malay political, economic and religious leaders, and the majority of ordinary Malays who occupy the middle ground. What they do in the months ahead, how they rise to the challenge, will determine whether Malaysia will remain a “democratic and independent state founded upon the principles of liberty and justice and ever seeking the welfare and happiness of its people…,” as our founding father, Tunku Abdul Rahman, declared in his 1957 independence declaration, or just another morally bankrupt, kleptocratic, two-bit, third-world dictatorship. I pray God will give them wisdom and courage to do what is just and right.